In Genesis 1:5, part of the creation narrative in 7 days, God calls the light ‘day’ and the darkness ‘night.’ Why wouldn’t God just call them ‘light’ and ‘dark?’ This signals to us that something strange (to us) is going on in the text, and it turns out that it has to do with how we understand existence in the modern world. That might seem like a huge leap, but allow me to explain. It’s completely natural that we would take this same material-oriented ontology to the text of Genesis 1, because when we talk about the origins of the universe, we do so in a materially oriented fashion. We want to know about the age of the Earth/universe, the composition of planets and stars, distances, etc. These are all material concerns. Material ontology is part of our worldview, and worldviews always insert themselves into interpretations. So, we have to ask ourselves: Did the Israelites (and the rest of the Ancient Near East) view the world in a materially oriented way? In other words, when they wrote about origins and creation, were they referring to the materials of the universe, or did they have something else in mind? Obviously, I wouldn’t have bothered asking the question if I didn’t think there was something else going on. We can see a different understanding of the world in verse 5, where God calls light and dark by different names. ‘Day’ is a period of light, and ‘night’ is a period of dark, and when that section concludes with “And there was evening and there was morning, the first day” we see exactly what God just created: Time. A period of light followed by a period of darkness gives us the basis for time, unless you live in Scandinavia during either the winter or summer. It’s important to note that for us materialists, God hasn’t created anything material on this day. The sun, moon, and stars don’t come until day 4, and no one in the ancient world had any concept of the particle-wave theory of light. Rather than creating materials, God is establishing functions. That word, functions, is enormously important because while we often judge the existence of something on its material properties, the people of the Ancient Near East had a functional ontology. For them, something existed if it had a function in an ordered system. My cheap, plastic chair, in this sense, isn’t a chair until someone actually uses it, giving it a function. 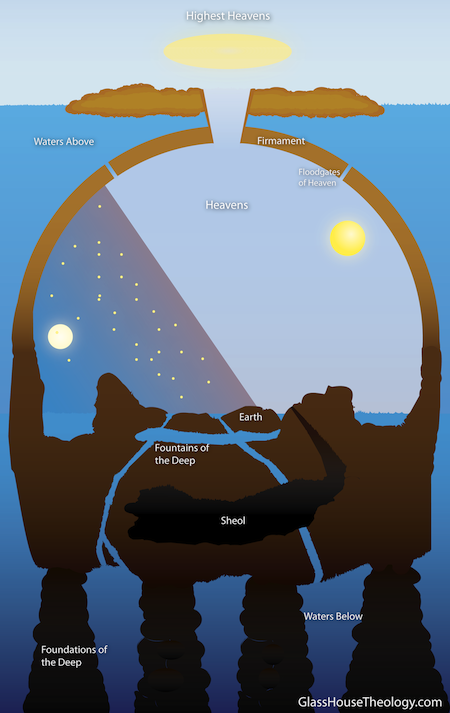 The ancient Israelites didn’t understand how the earth revolved around the sun, or that the moon reflected the sun’s light, but the interchange between night and day created the function of time. Before we jump into the rest of the days in Genesis, we ourselves, in our materially-ontological glory, use functional thinking as well. If I told you that I got a new computer, you probably aren’t going to be interested in when and where it was manufactured, the chemical composition of the components, etc. You’d be asking me about its speed, storage capacity, features, battery life, etc. In other words, you’d ask me about its functions, not its material composition. The Ancient Near East, and Genesis 1 in particular, is quite like that. And God said, “Let there be an expanse in the midst of the waters, and let it separate the waters from the waters.” And God made the expanse and separated the waters that were under the expanse from the waters that were above the expanse. And it was so. And God called the expanse Heaven. And there was evening and there was morning, the second day. So… the big question here is: What did God actually do? He didn’t create anything material, but what function do we see? Go back to what I said about waters being “above.” The heavens/firmament hold back those waters and control their flow – meaning they allow for the function of precipitation and weather. And God said, “Let the earth sprout vegetation, plants yielding seed, and fruit trees bearing fruit in which is their seed, each according to its kind, on the earth.” And it was so. The earth brought forth vegetation, plants yielding seed according to their own kinds, and trees bearing fruit in which is their seed, each according to its kind. And God saw that it was good. And there was evening and there was morning, the third day. A lot happens on day 3. Dry land appears, the seas are gathered together, and then the Earth does something amazing: it sprouts vegetation. It never says anything about the material composition of seeds and plants, and we are only told that the Earth itself sprouts. If we hold to a materialistic view of this creation account, then it would seem as though plants are just appearing like mold on a piece of bread. This won’t make much sense, and we would have to contort the text in order to make it fit into our worldview. However, from an ancient, functional perspective, here emerges the function of vegetation. We now have 3 functions: time, weather, and vegetation. In my next post, we will look at the functionaries. A german photographer developed a work of art that focused on death. Specifically, the artist produced photos of people when they knew their health was declining and then after they had died. The work represented a fairly diverse group of people at different ages and gave the observer background information leading up to the person’s death. The photos, one of life and the other of death, looked strikingly similar, and combined with each person’s brief life story, the whole work was quite haunting. I found myself not particularly enjoying the work, however, and like some profound movie, it stuck with me (and bothered me) for several days. But I could not figure out why. It wasn’t that there were pictures of dead people – Leukemia cured me of any acute fear inherent in death. Nor was it the fact that most of the subjects of the piece died of cancer – I found that kind of amusing because “it’s always cancer.” And no, you aren’t allowed to find that funny unless you have dealt with it – think of it like a club. An exclusive club. Expensive, too – even with insurance. Anyway, After a few days of mulling it over, I finally came to understand why the exhibit unnerved me to such a degree. The artist sought to celebrate both life and death, especially the latter. I am all for celebrating and cherishing life, but I will never do the same for death. Things were not supposed to be this way. We weren’t meant to die. Regardless of how readers of the Biblical Narrative interpret the beginning of Genesis, the anthropology is universal: our own mortality is a profound corruption. Life was given as a gift, death is the curse of our own doing. But we weren’t meant to experience this separation from those close to us; they weren’t meant to die, and neither are we. Death is not a natural part of the human life cycle, but rather it is decidedly un-natural. Treating death as anything else robs our ability to mourn, feel the pain inherent in death and separation, AND experience life to the fullest. Life is all we have right now, and death is an abrupt end. Seek to live a full life. Don’t fear death, but hate it – because it is a curse.